This week we are continuing with work in progress images of the Raven Q6 model. Adding the smokebox door, buffers, chimney, dome and smaller items such as the whistle, safety valves and washout plugs and she starts to look more like an actual locomotive. Adding the rear steps and brake gear finishes the larger parts and then we begin to work on the small details like handrails, rivets and pipework. Once this is complete the boiler is hidden for a time so we can access inside the frames to model the steam reverser piston. 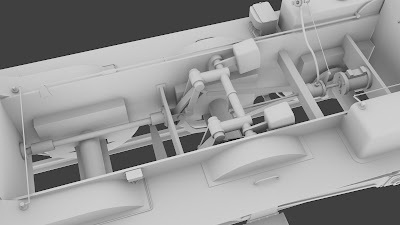 Also the inner valve gear (with its prominent counter weights) is built and carefully connected as it will need to be animated along with the wheels and outer pistons later on. A final going over to adjust part placement here and there and to add more details like the cab window surrounds and hand rails, the injectors behind the steps, and the locomotive's outer shell is complete. 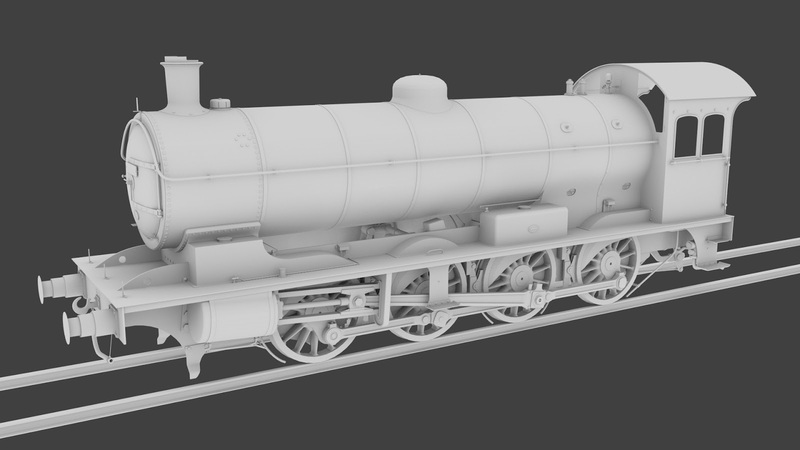 Next week, work starts on the cab. I'm following this with much interest, and its coming along well, but if I may hazard a comment, I think the smokebox dart is a little too small, and far back, so it almost looks moulded onto the surface of the door. Overall the loco is looking fantastic, but the dart throws off the 'face' a little. will this be on steam?